In 1932, a man named CE Doolin purchased a bag of corn chips from a small cafe in San Antonio. He soon learned that the manufacturer of the chips was eager to sell his small business. CE Doolin bought the recipe, and began selling FRITOS Corn Chips from his Model T Ford. That same year, in Nashville, Herman W. Lay began a potato chip business. He started delivering the snack foods, but soon bought the manufacturer and the HW Lay and Company was created. HW Lay and Company became one of the largest snack food companies in the southeast. By 1961, the Frito Company and HW Lay and Company merged to form, what remains to be, Frito-Lay, Inc. Dating as far back as 1939, Frito-Lay, Inc. has been taking steps to reduce the “environmental footprint” that it would leave. Over the years, they have focused on reducing harmful emissions, and harnessing renewable energy. In a span of 5 years, they have eliminated 5 billion square inches of packaging. They’ve done this by reducing the amount of materials they use by 10%. Thirty-three percent of every 10.5 ounce bag of SunChips is made with renewable, plant based materials. They reuse shipping cartons an average of five times. This effort now saves five million trees each year. On Earth Day of 2010, Frito-Lay will be releasing the first fully decomposable chip bag of its kind. It is said to fully decompose in about 14 weeks when placed in a hot, active compost pile or bin. When the announcement of the bag came out on their website, it couldn’t have been said better than this, “So you eat the chips. The earth eats the bag. And we all live in a cleaner world.” Watch the time lapse video below to see the bag decompose for yourself. Throughout the years, Frito-Lay has achieved several awards honoring their strive towards making a cleaner world. Their first national award came in 2003 for their environmental sustainability efforts from the Alliance to Save Energy. In 2006, they were named the Energy Star Partner of the Year for the first time. They were the only Consumer Packaged Goods company to receive this award. In 2007, a deadly tornado struck in Greensburg, Kansas and destroyed 95% of the town. 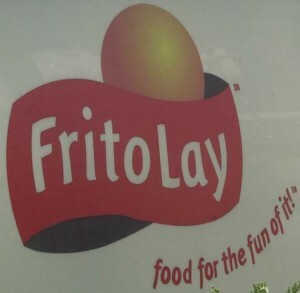 Frito-Lay stepped in and began rebuilding the town alongside residents from the community. The company donated one million dollars to support the building of a solar-powered business incubator. This building was to house 10 local businesses and provide the foundation for a new economy. Frito-Lay Sales Representative Doug Ulrich was one of the 1500 that lost his home and belongings to the tornado. The company contributed to the rebuilding of a new, greener house for Doug and his family. In response to Frito-Lay’s help, Doug says, “It’s really nice to know that the company I work for is willing to invest the time and money to see that this town rebuilds in a way to become even better than it was before. It’s amazing to see the kind of progress that will come out of such a disaster.” With close to 40 different brands and well over 250 varieties, Frito-Lay, Inc. offers snacks from potato chips and pita chips, to nuts, dips, salsas, cookies, popcorn, and sunflower seeds. They now account for about 59% of the snack chip industry of the United States. There are upwards of 45,000 employees working for Frito-Lay, Inc. throughout the United States and Canada. 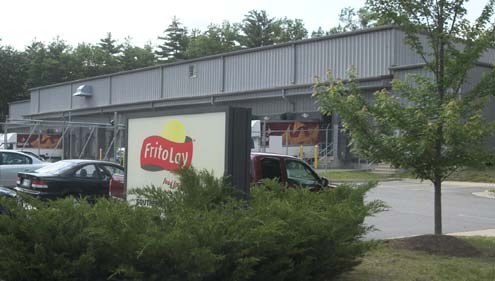 Frito-Lay, Inc., has a plant located in Londonderry, NH. The plant is located at 22 North Wentworth Ave. Browse the map below for detailed driving directions. Frito-Lay, Inc., can be reached at (603) 425-2227.